I signed up for an online sewing course called Home Ec. It's a fun little community of people that want to learn how to sew. We have one year to finish 26 interesting and practical sewing projects at our own pace. Here are the results from my Project 1. Pretty much blah and boring, wouldn't you say? I enjoyed learning to use the zigzag stitch but my corners were pretty scary looking. Backstitching on them threw me for a loop. The next part of the project was supposed to be Double Sided Cloth Napkins. Wanna see the impressive progress I'm making? Yup, that's pretty much as far as I've gotten-- washed and dried the materials. I am lame-o. My overachieving friend made 18 of them! As for myself? I think I'm going to make ZERO. I've lost my oomph and am completely unmotivated to work on something that I know I won't use. I did, however, make the bonus project for the week. Does this extra credit mean I'm forgiven for getting a big fat zero on the double sided napkins? 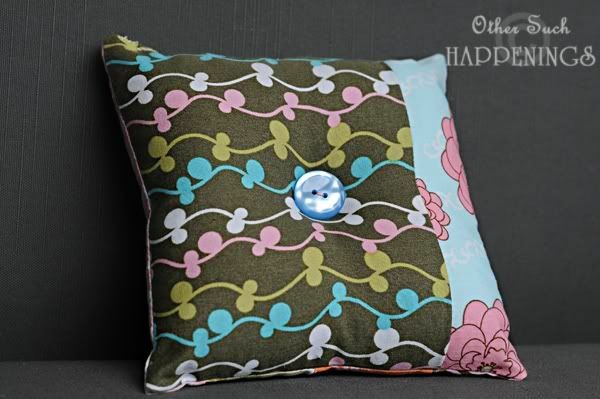 Isn't the front of this pin cushion pretty? (Guess I should've stuck some pins in it to keep it from looking like a pillow!) I used some scraps that I had from making my niece's baby quilt earlier this year. And I even like the back side of it! I first learned to sew in Home Ec when I was in the 7th grade and picked it up again 7 years ago when Austin was 4. 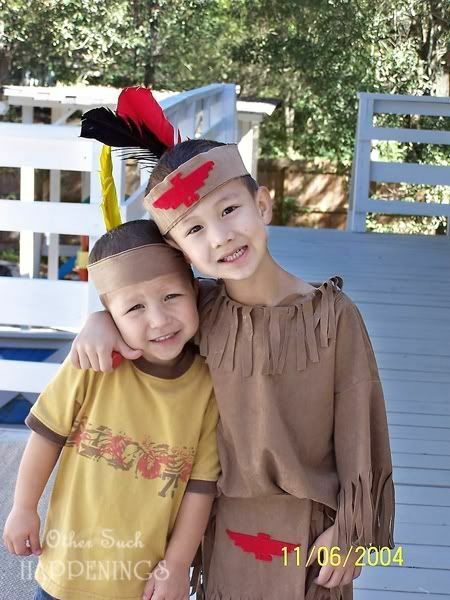 My first back-to-sewing project was this Indian costume. You'd be amazed at how many different ways one can sew a sleeve on the wrong way, but I think it turned out rather nicely (just don't look too closely at the crooked seams). I am really excited about learning to sew more than just a straight stitch in this course! As well as having an excuse to buy pretty fabrics. *sigh* I adore fabric, especially from Fresh Squeezed Fabrics. Do you sew? Do you wish you could sew? I took home ec in 9th grade. We were to make a shirt and I didn't even finish it. It's one of those things I would LOVE to do, but am not very good at and give up because of lack of patience. :) I LOVE your pillow. I think you should ditch the double sided cloth napkins (does anyone really use cloth napkins?) 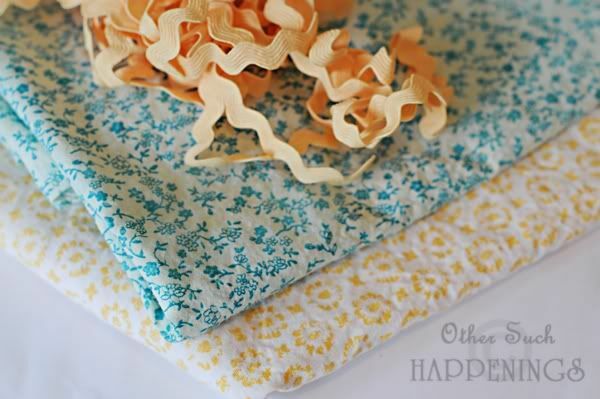 and make something else with that very pretty fabric. Love you! 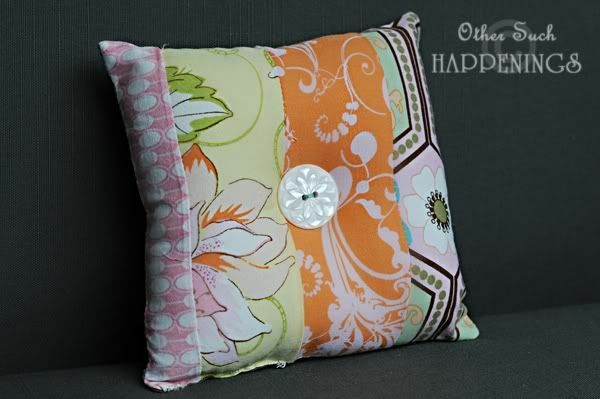 oooohhh I love to sew and that pillow is adorable! I wouldn't have made the cloth napkins either. I mean that would just be one more thing for me to wash. :snort: I went to Wal-Mart yesterday, cause you know that's where all the cool people are, and I found a clearance bin on fabric. I was in HEAVEN. I bought like 6 different kinds. :D Now just what to do with them...that's my problem. Lots of fabric and no ideas. I'm such a dweeb. Oh my word. Austin and Noah are so stinkin' cute in that picture. I want to pinch Noah's cheeks. Cutie-patootie! I never took Home Ec in high school. I had zero interest in learning anything useful. I think I'm going to go back and make that cushion. I'm sure I have enough fabric to pull it together. 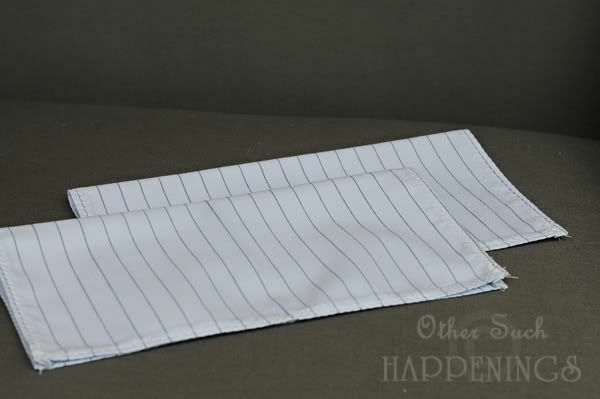 If you wouldn't use the double sided napkins, you could make a set for a gift for someone who would. I know some families who actually use cloth napkins for special occasions. Man! One project finished and you're done? What. I totally feel you about needing motivation to sew. I truly have to be in the mood. Despite that, yes I sew and have been enjoying getting back into the "seam" of things w/the exception of a needle in thumb injury I experienced last month. After it was removed, I continued w/my project and finished. I love your fabric choices for the double-sided napkins. Go on and finish them. Your pillow is excuse enough. I love it. I also like the costumes your boys wore. Isn't that why we really sew, for our children? I'm committed to three costumes by October for the annual Harvest Festival. Also, it sounds so strange. How does sewing through online instruction really work? I'm going to have to check that out. I love your pillow. I used to sew with my mom when I was in high school. I wish I had TIME to sew now and maybe a girl to sew for:) My friends with girls are doing such cute dresses. I think that boys' T-shirts are just cheaper to buy. But costumes are a good idea. I think I'll go look for some superhero cape patterns since they are constantly having me tie towels and blankets around their necks:) Don't give up - I want to see what else your course has you make! I fall in the "wish I could sew" camp. Love the pillow! I don't sew and I think that is the prettiest pin cushion I have ever seen in my life. Yeah you should have added pins to the pin cushion! LOL I have been taking sewing classes! Our first project was pajama pants! It was fun! I am now working on a purse and curtains for my kitchen. I guess I need to blog about it and post pics huh? I think you are doing great! Don't give up! The projects you did do looked great! I love the pin cushion. Adorable! Especially the brown fabric on the back. I only sew a little and it is usually crooked! My mother is a brilliant seamstress. I wish she could give me lessons...but she lives in Australia! We sew like crazy whenever she visits. Your photography is excellent. Have you posted about the camera you use or how you learned? I did a little search, but couldn't find anything. I'd love to hear about it. Stacy, if you'll link your email addy to your account, I could reply directly back to you. I love love love the pin cushion.. It turned out great, and would be a GREAT going away present... hint hint. I am excited to start back up sewing when I get to PA.I love to sew.. I am not very good at it but I love doing it anyway. I have made a few quilts, and I am in the middle of making my beloved a quilt. Then my sister gets another one for her bed! I guess I should post that last sewing project Paige told me to. Thanks so much for replying to my question! I looked into that, and I really wanted to do it...:( maybe next go around! Your projects are all so cute! WOW great job! I can BARELY sew on a button. Sorry. I'm a bit behind on my emails, so I'm just getting to this one. I can SO sympathize with you, Marsha! I "learned" to sew in Jr.High Home Ec. But I wan't really interested in sewing then, so I didn't pay much attention. NOW, as a mom pushing 40, I WISH I could sew! I've recently inherited my aunt's sewing machine & used it for some mending. I LOVED the feeling I got, sitting at that machine & SEWING! I'm gonna have to get hooked up with someone who can teach me more. Now about cloth napkins... Have you tried using them at your family meals? I always thought they were only for fancy meals & were too pretty & fancy to actually USE to wipe greesy fingers & mouths. But (as an attempt at "going green") I bought several sets at a garage sale for us to use at meals & hopefully stop using so many paper napkins. WE LOVE using cloth napkins! I bought some more on clearance, so now we keep a basket full of neatly folded cloth napkins by the table (an idea I adopted from a friend who also uses cloth napkins). It's so handy for meal times, and using them is much more comfy/homey than using paper napkins. Just think of them as tools & use them as intended. Don't be afraid that you'll ruin them. I think you'll enjoy it, like we do.